This impressive and highly distinctive building stands in one of the main commercial streets of Helensburgh and comprises club rooms above ground-floor shops. Authorship: The drawings submitted to Helensburgh Dean of Guild Court cannot now (2014) be traced, but they are known from photographs which show that they had annotations in Mackintosh's hand. There is no documentary evidence that he designed this building, but it is difficult to see who else in John Honeyman & Keppie's office in the early 1890s could have been responsible for its more individual features. 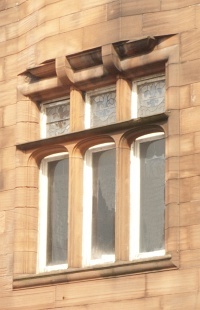 Certain details, such as the carving around the ground-floor entrance to the club rooms and the unusual treatment of the right-hand bay, have parallels in other works of around the same date, such as the Music Room at Craigie Hall and the first phase of the Glasgow School of Art, where Mackintosh's authorship is more certain. Corroboratory evidence is provided byRonald Harrison, an early student of Mackintosh's architecture in the 1930s who had access to the office records. He included the Conservative Club on lists he compiled of works he believed were by Mackintosh, and of drawings produced in the office during Mackintosh's time. Current name: M & Co.
1: Glasgow Herald, 10 December 1895, p. 7.